Adventure Travel Gadgets: What Can You Not Live Without? As I prepare with great anticipation for a safari in Botswana in June, I’m starting to list items I need to make sure are tucked into my duffle bag. In some respects, I’m kind of wistful for the era in which I last traveled to Africa, back in 1993: I owned no cell phone, no laptop, no iPod, no digital camera — nothing to encumber me with concerns about how I would communicate, let alone recharge everything. 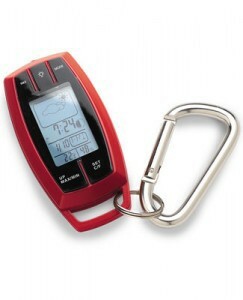 Handy-dandy alarm, calendar and weather station, all on a keychain. Has a lot ever changed in less than two decades! This time around, I’m thinking ahead about how I’m going to keep my camera battery charged, whether I should haul my laptop or buy an iPad for traveling or just rely on my iPhone, and wondering about various high-tech gadgetry that’s available now to make travelers’ lives easier in remote realms. I could keep a digital calendar, alarm clock and weather station on a keychain, tracking storm systems ahead on a tiny LED screen. I could take along “Cry of the Kalahari” an E-reader like a Kindle, rather than hauling heavy books, track my journey across the savannah on a portable GPS device, or purchase a portable sports cam for my 16-year-old son to record the trip he hopes to make over Victoria Falls as a passenger in an ultralight. All that said said, I kind of yearn for a completely unplugged vacation. I don’t think I’ll follow the siren song of too much mobile technological wizardry. And, as blogger Sean McLachlan points out in his piece on Top 5 Travel Gadgets NOT to Take On Your Next Trip, high-tech electronica is eminently appealing to thieves. But I do want to keep my camera battery charged. As I’ve been doing my research, I’ve come across battery extenders as well as solar-powered chargers with universal power supply. I’ve still got a lot of comparison shopping to do. I’d love to hear from Natural Habitat Expeditions readers as I do my research, and I bet fellow travelers would, too. Are there devices you swear by? Gimmicks you wouldn’t waste precious packing ounces on? Please chime in!